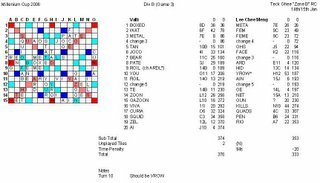 I joined the Millenium Cup this year as I wanted to complete all the major Scrabble competitions in Singapore. I took part in the NTU Open, the Singapore Open, the Lim Boon Heng Cup in 2004 and the Singapore Nationals in 2005. This year's Millenium Cup is held at the Teck Ghee "Zone B" RC and it was my first time going there. 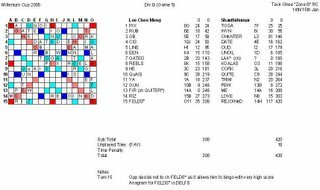 A total of 21 players took part with the top ten in division A while the rest in division B. I was placed in division B and the format was round robin and five rounds of King of the Hill. 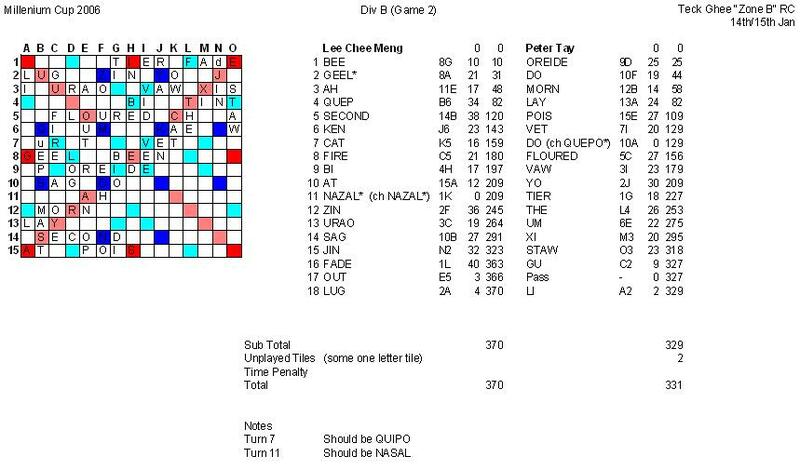 Li Wei pulled ahead after he scored his second bingo. I had ACI?RST shortly after but had no place to put it. 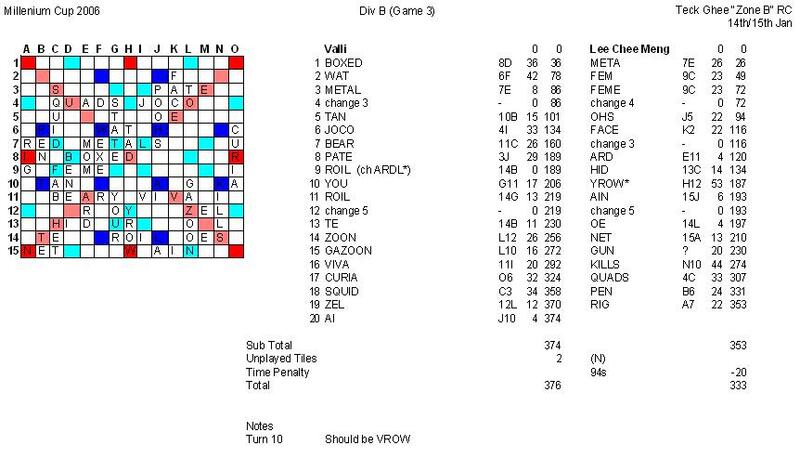 Saw a bingo line in the middle with a "G" at H8 and "EE" at 9I, so I tried GRACIeST* (86). 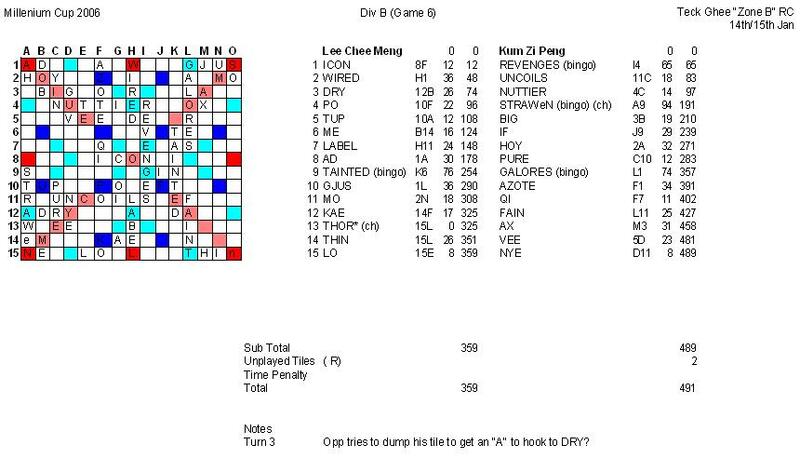 Li Wei didn't challenge even though he knew it was a phoney as it allowed him to play DONSIEST(85) 15A. L 409-531, -122. 1 Loss (Accum spread -122). 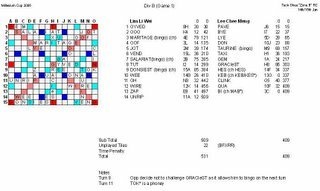 Our scores are very close until I put down JIN N2 hooking to XI M3. I knew that all the "O"s and "D"s have been used up, so I thought the TWS cell would be safe. Realised that I missed out another possibility when I drew the last blank from the bag after my turn. Was able to score with FAdE(40) and pull ahead to win! W 371-331, +40. 1W 1L (Accum spread -82). (Mistake in toucanet. I was left with a single-score letter tile when Peter finished and I forgot to add that to his score). The board was very closed after the first 3 moves of BOXED, META and WAT all stacked nicely one above each other. I changed tiles several times with no idea what to do next as both of us were unwilling to open up. Scored quite high with a phoney YROW* later which I thought I have seen on my 3 letter hook list. My eye sight must be getting worse as I now realised that it was VROW on the list. Hmm, maybe I shouldn't have saved paper by printing four pages on one sheet of paper. L 333-374, -41. 1W 2L (Accum spread -123). We had an exciting game with lots of high scoring plays and finished the game in just 11 turns! 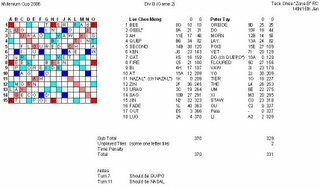 I had very good tiles and was able to bingo easily with simple words. 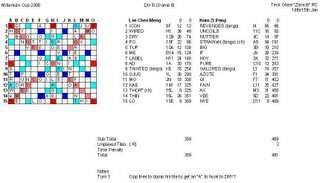 Had AENOSRTU at one time and I was trying very hard to fit what I thought was a potential bingo, UNROASTED*, through an existing D in O8. Was very puzzled why it did not fit until I realised that I had overdrawn and the S was taken away from me. 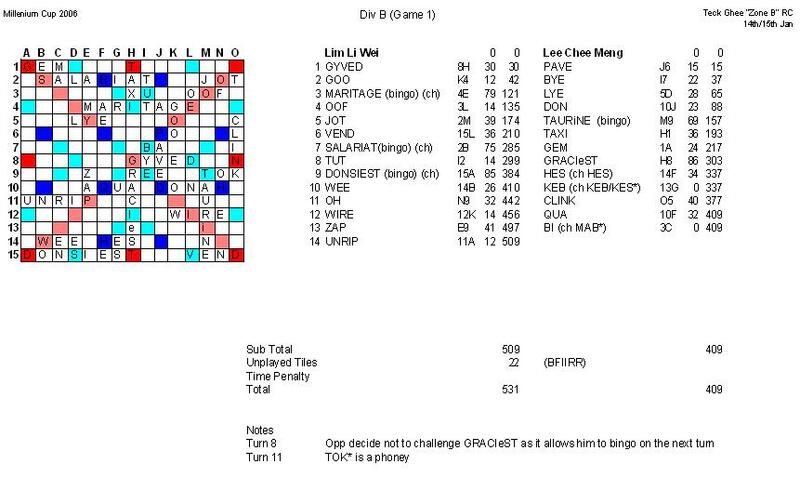 Luckily, it was still my turn and I was able to bingo with OUTLEARN through an existing L on the board. 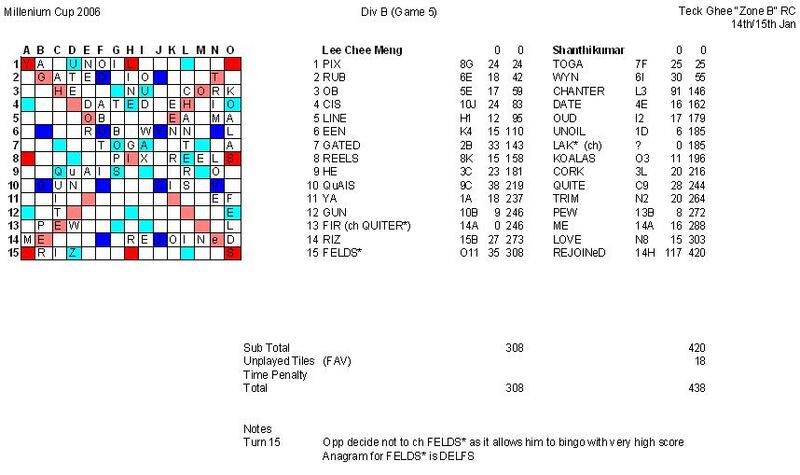 Guo Cong had only 2 bingos but he scored very high with non-bingo words! 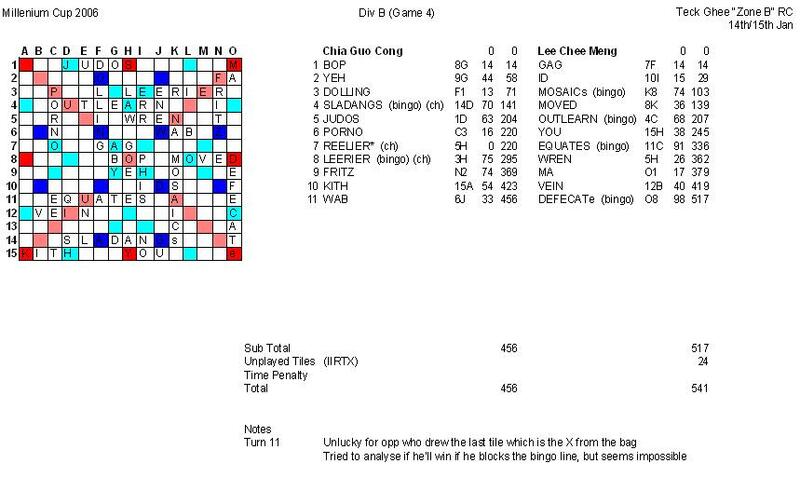 It was unlucky that he drew the X on his last move and I was able to bingo out with DEFECATE(98) down the triple score line. W 541-456, +85. 2W 2L (Accum spread -38). Was trailing behind after Shanthikumar scored his bingo. Thought I could have caught up if I hadn't tried to hook R to an existing QUITE on the board and got no points for that turn. He let go my phoney FELDS(35) on the last turn as it allowed him to bingo out with REJOINED(117) which is the high word of the day. Had no chance of catching up as Zi Peng scored two bingos early in the game. 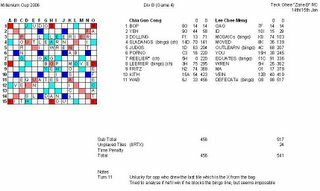 Bingoed with TAINTED(76) but it was immediately followed by Zi Peng's GALORES(74). Lost badly in the end. L 359-491, -132. 2W 4L (Accum spread -300).